Pietro D’orsa found work in Australia as a winegrower circa 1868, quenching the thirst of miners during the Victorian gold rush. Several generations later, Pietro's progeny returned to viticulture, Sanguine Estate's inaugural release was universally embraced by enthusiasts of fine Heathcote Shiraz, the entire vintage sold out within a week. 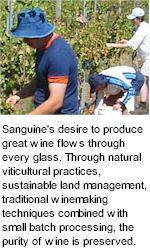 Sanguine employ traditional winemaking practices, Shiraz and a small component of Viognier, are hand picked and co-vinified, to achieve a marvelous expression of Heathcote, solid, seamless and exquisitely fragrant. Dark, impenetrable ruby hues. Ripe blackberry and dark plum bouquets, vibrant and youthful with the spicy undertones of subtle oak, florals and Viognier apricot notes. The palate is richly laden with dark juicy fruit characters which roll through to the end, the mouthfeel is textural, the solid weight of fruit is supported by a firm length of balanced tannins. A Shiraz that lingers long and soft, Progeny will open up very well after a decanting.